Wappy Dog Game & Accessory For the 3DS Is As 3D As It Gets | OhGizmo! By Andrew Liszewski on 06/02/11 • Leave a comment! Improved graphics and a 3D screen might have made the latest of version Nintendogs + Cats for the 3DS seem a lot more realistic than the original 2006 version, but it certainly can’t compete with the 3D effect of Activision’s upcoming pet sim title, Wappy Dog. 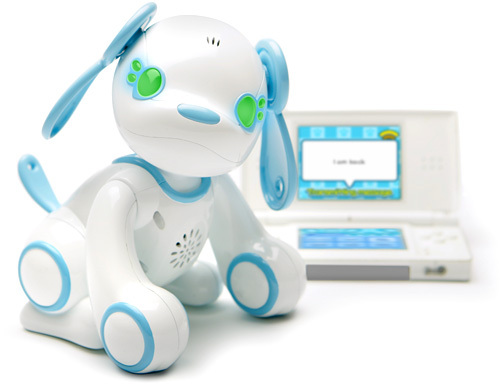 Like with Nintendogs + Cats, you get to interact with a virtual representation of Wappy Dog, who looks like a kid-friendly version of Sony’s AIBO. But the hook is that the game also comes with a real-life version of Wappy Dog that includes touch sensors, a mic and is able to wirelessly communicate with the 3DS. So you can interact with it via the game, or in real life. The goal, like with all these pet sim games, is to improve Wappy Dog’s mood by taking care of it with regular feedings, cleanings and playing games. Five different mood states are expressed through the colors of its light-up cheeks, covering everything from unhappy to stubborn to happy and content. Players can also talk to Wappy with more than 18 different voice prompts being recognized, and it will respond with one of 350+ evolving barks that are translated via the 3DS. And because the whole point of the 3DS is to be a portable gaming system, Wappy Dog offers two modes, Home & Travel, that allow you to keep playing with the dog while you’re away from it. And when you return, your dog’s progress will be synced back to its physical counterpart. Available sometime this Holiday season.